In overall good condition. A little dirty but no real damage. Tassel has been replaced in the past. A very hard to find holster and harder to find belt. I was told the belt is not original.Shipping is included in the USA. 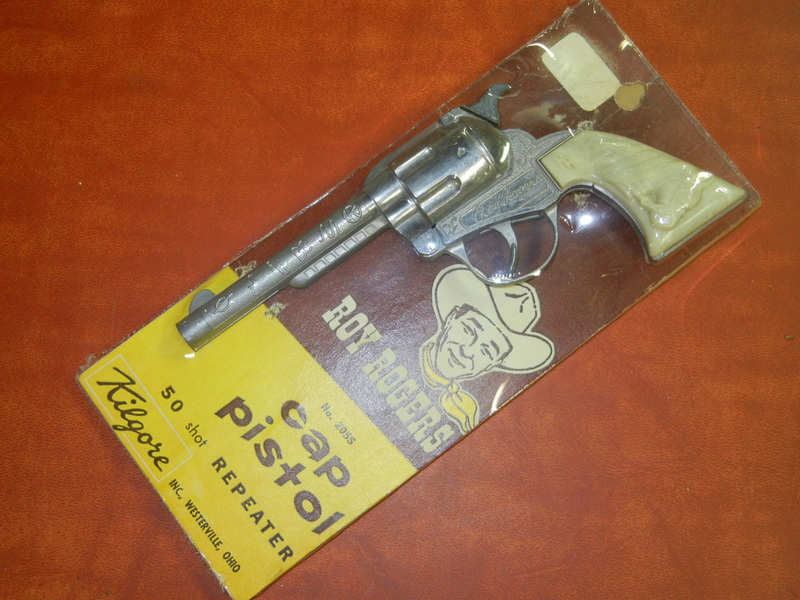 Cap Gun is in very good condition. No damage to gun or grips. The original staples that held the gun to the card are missing. Gun has been shrink wrapped to the card and a loose piece of cardboard is behind the card to protect it from bending. Both the shrink wrap and backer cardboard can be removed with no damage to the original card. Plating on this Rustler 45 will be hard to beat. Very minor wear. Worst is at the end of the ejector rod tube. Operates correctly. Does not appear to have been played with. Cylinder rotates with each pull of the trigger. All 6 shells are included.